I used to be an avid Foursquare user until someone mentioned that the social media platform makes it easy for strangers to know where I am. At the time, I was in college and I always felt safe on campus, but after thinking about my use of Foursquare, I suddenly felt unsafe using it. My mind immediately went to the worst, thinking I was going to be kidnapped. This experience made me rethink how I use social media, including what I share and who can see my posts. We’re going to lay out some guidelines we suggest when using social media so you can be as safe as possible using your online accounts. Everyone has their own opinions on what should and shouldn’t be posted on social media. While some like to share regular updates about their lives, others like to keep things more private. There is no right or wrong way to use social media, but there is a safe way. Here are 10 things you can do to stay safe on social media. The most important thing you can do to protect your social media accounts is using a complicated, secure password. Even though this gets preached more than anything else, many of us forget to follow this simple rule—including me. Follow these guidelines when creating a password for your social media accounts. Now, you have to remember that password, which isn’t easy since it has 12 characters that include a mix of uppercase, lowercase, symbols, and numbers. Consider getting a password manager to store all your passwords for your various social media accounts. That way, you don’t have to remember all the complex passwords you created. Lastly, change your passwords regularly. 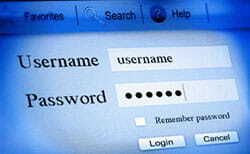 We recommend changing all your passwords (including accounts that aren’t social media-related) every six months. Even though social media sites have spaces for you to enter your home address, phone number, email, etc., that doesn’t mean you have to fill them out—and honestly, it’s better if you leave them blank. If you need to share private information with someone, do it person-to-person rather than broadcasting it to all of your friends. Does the kid you haven’t talked to since kindergarten need to know your home address? Probably not. Make sure your privacy settings are up to date. Whenever a social media app updates, there is a chance that the privacy settings have changed. While you don’t have to read through the fine print on every update, you can check for new privacy options and make sure you haven’t reverted to previous settings. Do you want everyone to see what you post? If you only want people you’ve approved to see what you share, you should set your accounts to private. You can do this with practically every social media account. You can also adjust the privacy settings on individual posts to limit who sees each one. Disable your location settings so people can’t see where you are via your social media channels. You’ll notice that Snapchat, Instagram, Facebook, and more give you the option to turn location tacking on or off. Turning this feature off is the safest option so that you don’t post your exact location when you update your followers with posts and photos. Do not post when you are leaving on vacation. This is one of the most common social media no-nos that nearly everyone does. We want to share the excitement of our vacations, but who’s to say that person you friended more than five years ago isn’t waiting to break into your house and steal all your belongings? Maybe that’s extreme, but announcing your absence does pose a risk. For the sake of your safety, keep from posting updates or photos until you’re back from vacation. Then you can tell everyone all about where you visited and what you did. This is a given, but it’s worth repeating: don’t share your passwords. We know you’re only sharing it with people close to you (best friends, significant others, etc. ), but you don’t know who they may share it with or what they may post. It’s better to be safe and keep it to yourself. Before sharing a photo with your followers, examine it for anything you may not want to share with others, like if you took a selfie and your laptop shows your online banking information in the background. Make sure you’re sharing only what you want to share. An unfortunate and highly publicized instance of this risk was when Kim Kardashian West was robbed after displaying her expensive jewelry on social media. While you may feel the pressure of having more “friends” on your social media accounts, it may not be the safest way to represent yourself. Accepting friend requests from people you do not know could be dangerous. Unfortunately, not everyone has good intentions, especially online. Adding strangers on social media increases your risk of identity theft, leaked personal information, spam, home intrusion, and other crimes. We suggest only accepting friend requests from people you’ve met in person. This is even more important when using a public computer. Always be sure to log out of any online accounts. We also recommend logging out on personal computers because you never know when your computer could fall into the wrong hands. Whenever possible, use a passcode to unlock your internet-enabled device. 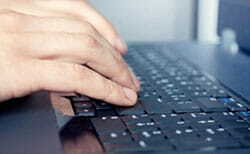 Most computers, tablets, and smartphones have these capabilities. Take advantage of them because it’s one more step hackers have to go through to access your data. We recommend using different passcodes for each of your devices. Remember, in the end, it’s about what you’re comfortable sharing. Everyone uses social media differently, and we want to make sure you know how to recognize and address common social media risks to keep you and your belongings safe. 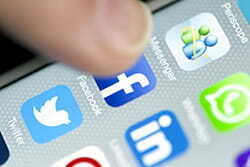 What social media security tips do you have to share with us?